To cook jambalaya; Saute garlic, onions, green bell pepper in hot oil. Stir cook until onion becomes transparent. Add salami, sausage and rice. Stir-fry until rice is coated with oil.Put in the bay leaf, thyme leaves, salt, Tabasco sauce, tomatoes, and chicken broth. Cover the casserole and simmer until the rice is cooked. Before serving, mold Jambalaya in desired shape, using a small bowl or cup, then remove from mold. Saute garlic, onions, green bell pepper in hot oil. Stir cook until onion becomes transparent. Add salami, sausage and rice. Stir-fry until rice is coated with oil. Put in the bay leaf, thyme leaves, salt, Tabasco sauce, tomatoes, and chicken broth. Cover the casserole and simmer until the rice is cooked. Before serving, mold Jambalaya in desired shape, using a small bowl or cup, then remove from mold. Serve warm. 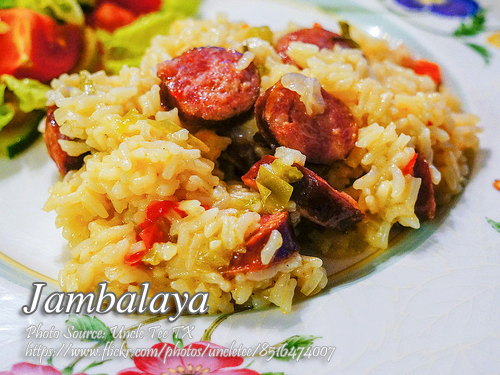 Thanks for this jambalaya recipe!